How to instantly Recover or Reset SA Password? When we mention sa, we have to explain what MS SQL Server is. MS SQL Server is one of the most widely used relational database system produced by Microsoft Corporation. Both MS SQL Server 2005 and MS SQL Server which are prevailing at present use .mdf file to store data. While sa(abbreviation for "System Administrator") is the password associated with a MS SQL Server. It is typical term used to refer to the database administrator. If you are running SQL server, the single most important task is to protect your .mdf files from prying eyes. If there's no password provided, your database is wide open! Any user who can reach your machine can gain full access to your databases by simply using the default login parameters (By default, the password is blank). Insert a password and repeat this test for the other accounts and databases you're responsible for. What happens with SA password? Yes, so you create a very long password. When you are boasting of your caution and smartness, disaster happens: you lost your sa password. This complex passwords don't bring you safety but troubles. At this moment, SA Password Recovery will play the most important role to reset SA password. How to recover SA Password? To get started, download SA Password Recovery, and setup and run it. There will be shown a user-friendly interface like below. And then Press "open" to import .mdf files from your PC to this program. All user name will displayed on the list. Select "sa" and click on "change password". To reset new password, you need to enter your new password and confirm it when a password resetting case pops up. It's quite easy, isn't it? 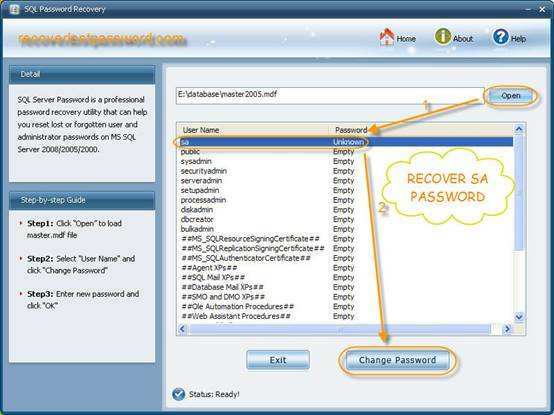 No hesitate, just grab SmartKey SQL Password Recovery to reset SA password.